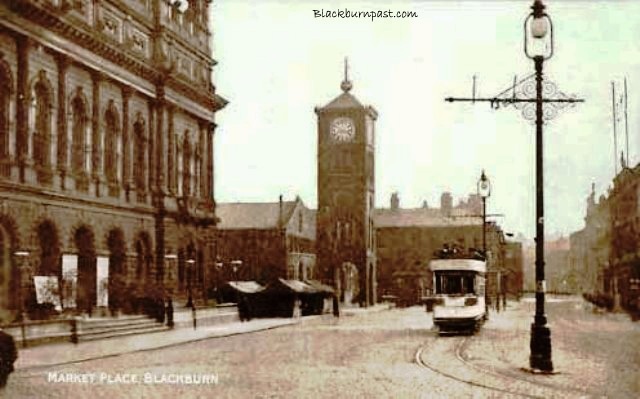 King William St, the Town Hall, market stalls, the Market Hall Clock Tower and a passing tram, viewed from the corner of Library Street / Exchange Street. Don't you just wish that King William St still looked like this (Without the Tram though)instead of what we have in it's place today. I only have vague memories of it to be honest although I was 13 when it was demolished, I never realised what "A Gem" it was at the time but I do recall all the different aroma's from the various goods being sold on the stalls both outside and inside the Market Hall. I was only 6 when they started demolishing the clock and market hall, so hardly remember any of it. Yet strangely, I have a very vivid memory of the fair on the market place (Victoria St side). I can also remember being in the old market hall with my mum, but again, remember very little of it really. I'm still intrigued by those twin flag pole things at roof level. They're on various old photos (the Griffin photo comes to mind). They're in this photo too, on either side of the Peel statue. Those pole things are a mystery Colin aren't they. I don't think "Roof Rugby" was as popular up't north as it was down't south. They could have been footy posts with Mr Peel acting as Golie though. I've often thought that they might have been early Radio booster masts,but in the early 1900's who the hell would have had a radio ! !